The Berlitz Norwegian Phrase Book & CD offers the most up-to-date, relevant content in both print and audio formats to help any traveler build a basic Norwegian vocabulary. The completely revised and redesigned Phrase Book contains hundreds of useful travel-related phrases - from saying hello to making a hotel reservation to shopping - and the user-friendly book is color-coded to provide easy navigation between sections. Also included are practical, full-color photographs, an extensive menu reader, and an English-Norwegian dictionary. The accompanying audio CD is narrated by a native speaker using a listen-and-repeat approach that helps you acquire and retain new vocabulary. 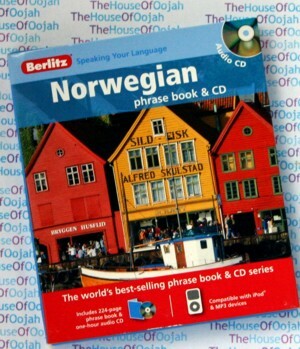 Whether traveling abroad for business or pleasure, the hundreds of travel-related expressions and the convenient, compact format make the Berlitz Norwegian Phrase Book & CD a suitcase essential. Norwegian (norsk) is a North Germanic language spoken primarily in Norway, where it is an official language. Together with Swedish and Danish, Norwegian forms a continuum of more or less mutually intelligible local and regional variants. These continental Scandinavian languages together with the insular languages Faroese, Icelandic, as well as some extinct languages, constitute the North Germanic languages (also called Scandinavian languages). Faroese and Icelandic are no longer mutually intelligible with Norwegian in their spoken form, because continental Scandinavian has diverged from them. As established by law and governmental policy, there are two official forms of written Norwegian — Bokmål (literally "book language") and Nynorsk (literally "new Norwegian"). The Norwegian Language Council recommends the terms "Norwegian Bokmål" and "Norwegian Nynorsk" in English. There is no officially sanctioned standard of spoken Norwegian, but the sociolect of the urban upper and middle class in East Norway, upon which Bokmål is primarily based, is the form generally taught to foreign students. This so called Standard Østnorsk (Standard East Norwegian) can be regarded as a de facto spoken standard for Bokmål. From the 16th to the 19th centuries, Danish was the standard written language of Norway. As a result, the development of modern written Norwegian has been subject to strong controversy related to nationalism, rural versus urban discourse, and Norway's literary history. Historically, Bokmål is a Norwegianized variety of Danish, while Nynorsk is a language form based on Norwegian dialects and puristic opposition to Danish. The now abandoned official policy to merge Bokmål and Nynorsk into one common language called Samnorsk through a series of spelling reforms has created a wide spectrum of varieties of both Bokmål and Nynorsk. The unofficial form known as Riksmål is considered more conservative than Bokmål, and the unofficial Høgnorsk more conservative than Nynorsk. Norwegians are educated in both Bokmål and Nynorsk. A 2005 poll indicates that 86.3% use primarily Bokmål as their daily written language, 5.5% use both Bokmål and Nynorsk, and 7.5% use primarily Nynorsk. Thus only 13% are frequently writing Nynorsk, although the majority speak dialects that resemble Nynorsk more closely than Bokmål. Broadly speaking, Bokmål and Riksmål are more commonly seen in urban and suburban areas; Nynorsk is seen in rural areas, particularly in Western Norway. The Norwegian broadcasting corporation (NRK) broadcasts in both Bokmål and Nynorsk, and all governmental agencies are required to support both written languages. Bokmål is used in 92% of all written publications, Nynorsk in 8% (2000). In spite of concern that Norwegian dialects would eventually give way to a common, spoken, Norwegian language close to Bokmål, dialects find significant support in local environments, popular opinion, and public policy. Norwegian is one of the working languages of the Nordic Council. Under the Nordic Language Convention, citizens of the Nordic countries speaking Norwegian have the opportunity to use their native language when interacting with official bodies in other Nordic countries without being liable to any interpretation or translation costs.